The Smith and Wesson Shield Grips made by JT Defense, add tremendous grip strength to the S&W Sheild. 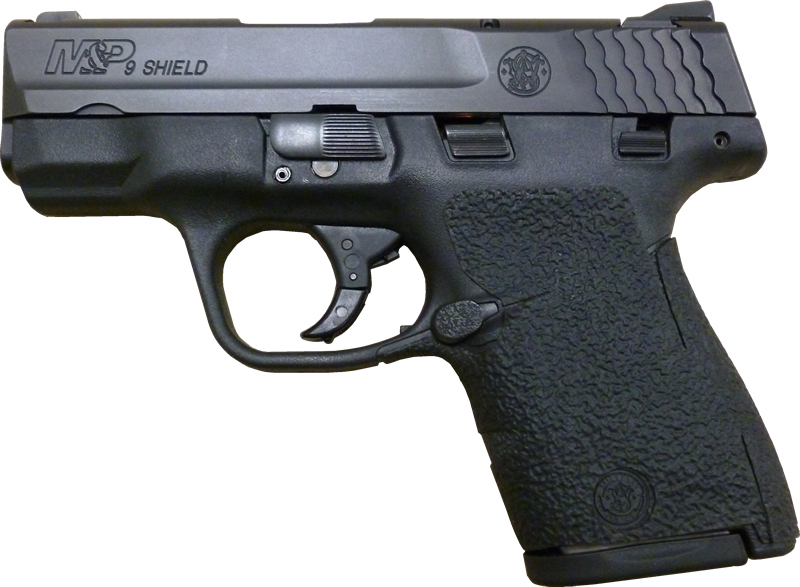 The slim profile of the Shield, along with the excellent trigger, great accuracy and great point and shoot friendliness of the Shield make it one of the best concealed carry , or just general fun range gun. The grip profile and thickness of the S&W Shield is 0.95" thick.. slender, and if you have larger hands, it is sometimes hard to get a firm grip on this pistol. Even those with smaller hands have a hard time shooting it, because the thin profile of the rear strap tucks into the pocket of your palm, creating a trigger jerk or slight roll into your palm, making the gun shoot slightly off center. The slight thickness added to the Smith and Wesson Shield grip tape, makes a WORLD of difference to the shooting experience with the shield. The grip no longer feels like the ultra tiny, thin, hard to hold Shield. The grip tape only adds a maximum thickness of .029" to each side of the Shield, still maintaining it's thin size, yet makes it feel like a much bigger firearm. 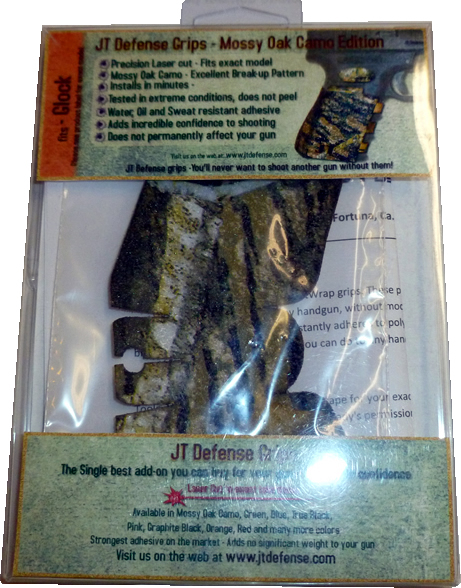 JT Defense makes excellent laser cut grips, out of a variety of different custom tapes. The True Black Granule is the most aggressive, giving a tremendous grip to your gun. However, if it's a daily carry, ensure that your holster is away from your side and that it will not touch your body, because it can cause wear into your side. We recommend for CCW (Concealed Carry) that you use our Rubberized black tape, or Pink, as they are just aggressive enough to get a firm grip, yet, do not cause the gun to wear a hole in your side. The Pink grip tape is VERY popular with the ladies, and once put onto a Smith and Wesson Shield and our female shooters try them, they simply cannot live without the grip tape. 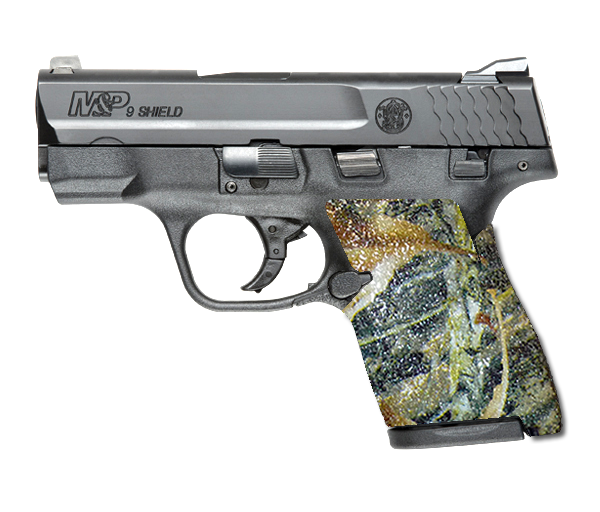 Recently, we put our pink grip tape on a Smith and Wesson Shield and left it with the gun store. We made a bet, that the first female customer who saw the gun and tried the grip tape, would walk out the door with that pistol. Sure enough, the first lady who saw that gun, picked it up and felt it, not only thought that our design was perfect, she thought that our grip tape was actually part of the pistol itself, and not an add-on tape. That's because, like all firearms, we start off with a very complicated 3 dimensional wrapping technique, that allows us to customize the tape around the gun, to perfectly wrap around the gun and bond the adhesive grip tape perfectly to the firearm. Relief cuts are made in very specific areas, allowing the tape to wrap perfectly around every area of the pistol. No other tape on the market is cut to the exacting criteria and put through the rigorous testing JT Defense does to each gun. Available in Mossy Oak Camo, True Black granule, Charcoal Black rubberized, Metallic Blue, Green and a host of custom colors. We weren't the first company to make grip tape or put grip tape on a gun, we just simply do it better. Try them out!